When his tiny fingers gently moved around her hands, her heart melted. It was love at first sight. She knew he was one of the abandoned babies. She knew he was destined to die as per the law of the land. She knew he was not of her status, and definitely not an Egyptian. But she couldn’t resist herself. She carefully lifted the tiny being, and brought him home! She raised him up as her own son. Wow! What an expected favour from God. What a sudden turn of events! The baby who would’ve otherwise been to the grave is now in the palace – growing up as a son of the Pharaoh. For a mother watching her son to die in the waters, isn’t it a miracle to see him not just alive, but thrive in the palace? When thousand other Hebrew male babies were abandoned and killed, this one, Moses, survived, thanks to the unexpected favour from God. 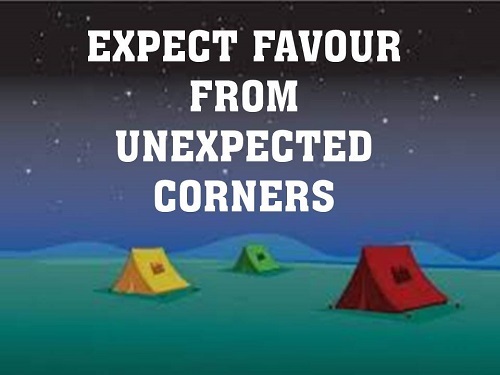 God’s favour will come to you from unexpected corners. God’s favour is able to lift you from the pit, however deep, and place you on the rock (1 Sam 16). His favour will turn your circumstance upside down. It will reverse your situation by 180 degrees (Gen 41:41). When his favour is upon you, you will reap a hundred-fold even during the drought (Gen 26:12). Lev 26:9 – For I will look on you favorably and make you fruitful, multiply you and confirm My covenant with you. I was born in a Hindu Brahmin family. My mother, Jayanthi, was a pious lady who offered daily prayers to the so-called gods and goddesses. I remember as a little child, I and my sister used to sit beside her early in the Tuesday and Friday mornings, watching her chant the mantras and sing banjans in front of nearly 30 images of gods and goddesses in our kitchen. We had no separate pooja room. We did not miss a single Hindu festival – these were times of great celebrations. Our balcony, corridor and entrance were filled with light – light from the diyas (candles). New dresses, relatives and friends at home! We had all that we wanted in life. Both my parents were working in bank. I and my sister went to school. We were good at studies - though not extraordinary. My grandparents took good care of us. We were financially able to look after ourselves in the expensive city of Mumbai. But in spite of having everything and despite persistent prayers, my mother felt something was missing – the divine peace she was longing for. Not one of those several gods and goddesses she worshipped was able to give her that peace – peace that surpasses all understanding. Things went on. Amidst several health problems that my mother faced, she had learnt to be grateful for what she was. Towards the fall of 1997, my father, Jayaraman, got acquainted with a Christian colleague in his office. 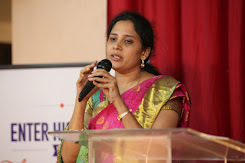 She had accepted Christ after being born in a Hindu family. She began sharing her experiences in life and offered a Bible to my dad. He brought home the Bible – the first ever time a book of Christian faith entered my house. And naturally, that triggered a cascade of strong oppositions, particularly from my religious mom. Every time, my father began sharing about the love of Christ that he heard through his colleague, there were explosions and bombardments. Of course! That was an expected reaction. There was a gradual transformation in my dad’s life. Slowly he realized he had been wrong in what he worshiped all these years. The 33 crore gods and goddesses are but only idols made by human hands. Who on earth has the power to create God who created us? They had no eternal significance and are worshiped only to satisfy the religiously thirsty human heart. My father began to shun away from the poojas (worship to the idols). He refused to accept the 'prasadam' (food offered to idols) that was offered. And he boldly removed the sacred thread that is considered an asset of every Brahmin male. A Brahmin boy gets the privilege of wearing the sacred thread after Upanayanam, a special thread ceremony. And now, that sacred thread is thrown away! My father began reading Bible every day. Problems, quarrels and fights mounted in our house. All the time, my mother would sit and cry. As a teen age girl, that affected me badly. No peace in the family! And there were reasons why my mother got worried. “I have two girl children. How would they get married? Get converted to anything you want, but after their marriage,” these were her words to her husband. Her idea of Christianity and Christian people, from her experiences, were no good. She knew them to be people given to alcohol. She knew them to be undisciplined and unclean. And now that her husband is going to be one among that group of people was a fact she could not digest. I didn’t know whom to side with and who was right – my mom or my dad? Totally confused! Why so much of turmoil in a peaceful family? Little did I realize, God was actually drawing us with bonds of love! While this kept continuing, my dad started to attend a church nearby, angering my mom even further. And of course, I and my sister were excited at the thought of going to a church, a place that we had never been before. First time in a church! New place, new people, new songs, new teachings and preaching – still it was so heavenly, so peaceful. I understood nothing that Sunday morning. I understood neither the songs nor what the pastor spoke. I knew not what it meant to give offerings. But, in spite of not understanding or knowing anything, I liked it. I loved being in church, for reasons unknown. Every Sunday, after attending the NCC class in the school in the morning, I got ready and rushed my way to church. My dad and my sister were with me. Three of us went to church and returned back happily, only to listen to my mom’s shouts and cries. Three of us – I, dad and sister – sat together in the evenings and began to pray to Jesus – the true God. We did not how to pray. Like a babe we spoke to Jesus whatever we knew. We specially began to pray for our mom. One night, as usual, my mother was crying to God at night. She said one thing, “I don’t know which is true God. I was brought up to believe the idols we prayed to, were true and powerful. And now I hear a totally different thing. Whichever God is true, please reveal yourself to me” and she went to sleep. How amazing! That night, August 30, 1998, at 3.00 am, she heard the voice of true God. And the voice uttered in her ears, three times, in Tamil, “The Spirit of God has chosen your house” and kept echoing even in the morning. Next day morning, August 31, she began cooking in the morning, before leaving for work, still perplexed about the voice she heard the previous day. And now, the next miracle follows! She cut the potatoes into two halves and put them for boiling. When she removed them and began peeling one by one, she saw a word written over the skin of the potato “you.” She searched the other half excitedly to find out what’s this. And she found other half of the same potato and there were words written there too. That read, “I love.” Wow! God confirms her “I love you.” Her long-shed tears are being answered. Eager and impatient, she shared that with us. New joy in our family after a long, long time! “Definitely Jesus is confirming that He loves you,” my dad exclaimed. Next day, still another miracle! In the evening of September 1, 1998, as usual, three of us began to pray. My dad prayed, “Lord, if it is really you who have written those words over the potato, I want a sure confirmation from your scriptures. You must say that those words are not written by ink” and he began to read the Bible. The portion for that day’s reading was 2 Corinthians 3. How astonishing are the ways God speaks to His people! “You show that you are a letter from Christ, the result of our ministry, written not with ink but with the Spirit of the living God, not on tablets of stone but on tablets of human hearts” - 2 Corinthians 3:3. “Written not with ink,” the very think my dad prayed for. Astonishing indeed! That verse was enough to speak to each one of us. The very same day, as a family, we accepted Jesus as our Saviour and we gave ourselves to serve the living God. Life took a new turn. Now, we have the peace – peace that surpasses all understanding. Personally, I could see God’s hands in my life. I was in 8th std. I began to shine in studies. My friends were surprised. How come? “This is why you accepted Jesus in your hearts,” was their immediate reaction. Things were not easy. Our pious relatives and best of friends could not accept this change in our lives. Many rejected us. But Jesus was all sufficient for us. He led us through remarkably. Several miracles followed! Till today, Jesus who held our hands is faithful to us. Christ is the only way to eternal life. He took the human form and died as a propitiation for our sins. He died on the cross and was raised the third day. He is the only source for true joy, hope and peace. Christ is not only the God of Christians, He is the God for all mankind. Even Hindu scriptures points out to Christ as Prajapathi, the savior of mankind. Rigveda talks against worshiping of idols. But how many of our Hindu brothers and sisters take time to read their own Vedas? Being born and brought up in Hindu Brahman family, today I and my family know Christ is the only way to heaven. He is the one and the only true God. In Christ, we have found true joy and satisfaction, a life worth living, and a real Father who loves us so much more than we could ever love Him. We experienced Him in our hearts and are witnesses to Him. We now know the difference between worshiping the creations and the Creator. In this 21st century, let us not be carried away by traditions and beliefs handed over to us by our forefathers. Let us not be spiritually blinded, but rather search for true God. Skeptics may argue the validity of Scripture or reason the existence of God, but no one can deny your personal experience with God. When my mom asked true God to reveal Himself to her, He did. You too can ask the one true God to intervene in your lives. Rev 3: 20, Here I am! I stand at the door and knock. If anyone hears my voice and opens the door, I will come in and eat with that person, and they with me.